President Anne Pendrak presided and called the meeting to order. A quorum was attained. Present were: Marjory Wells, Randall Wells, Barbara Pleasant, John Hopkins, Liz Warriner, Jane Cundiff, Amie Slate, Anne Pendrak, and Dede McGrath. Minutes: The minutes for September 18, 2017, and October 16, 2017, were not ready; approval was tabled for the next meeting. 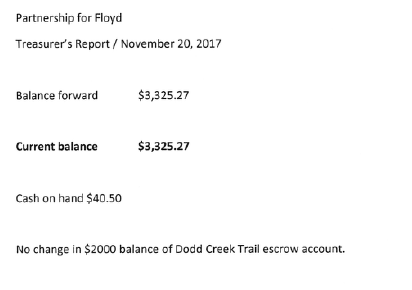 General Fund: Treasurer Barbara Pleasant reported there was no change in the accounts; the balance for the general fund account remains $3325.27; the Dodd Creek escrow account remains at $2000. Barbara’s report is attached and incorporated by reference. Dodd Creek Trail Report: Barbara reported for Mike that there was no update for the trail. 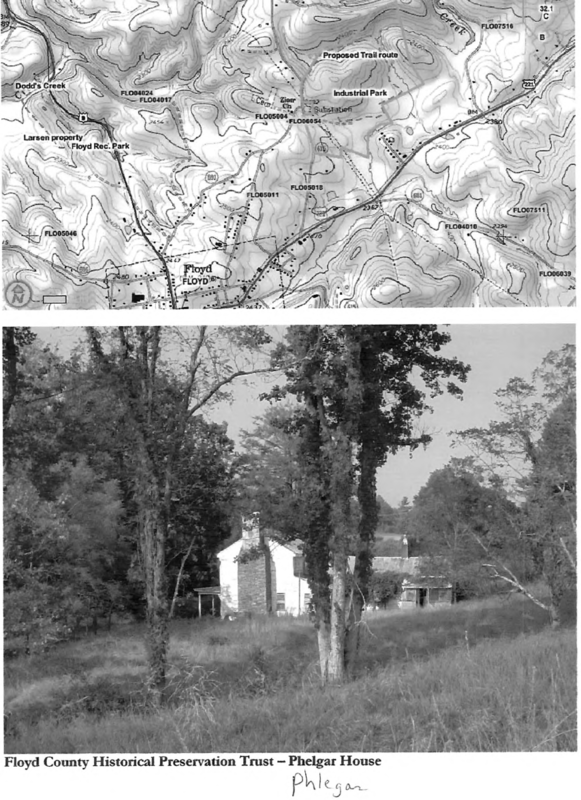 Some issues that will need work are: removing the invasive plant species and replacing with native fern; re-doing the end of the trail above the barn – it is very steep and may need stairs; possible problems with entrance road to park and pedestrian crossing. Barbara reported that the Planning Commission asked PFF to help with an Industrial Park trail (see map attached). The Historical Society will be renovating the Phlegar house. Lineberry Park: Marjory reported for Ellie that the Town wanted more professional music play elements in the park, but that after researching costs, may revisit the Kovak proposal. Community Marquee Sign: No new info. Collaboration Project: Jane reported that the showing of the water movie was well attended and that Sustain Floyd’s “Dine for a Cause” event had a good turnout. There is an up-coming meeting at the library for community ideas of energy on Dec 4th. 2018 Health Fair – March 24th: Jane reported that there will be a flat booth fee of $20 and will not be different fees for profit/non-profit. This will help defray the cost of the school which was $600 last year. It was suggested to put the application on the website. John indicated that Googleforms will also automatically place all the information into a spread sheets. We need more variety in food vendors and are looking for another food truck to come. A discussion was held on whether PFF will again offer free refreshments. No decision was reached, but it was decided that, if there is a second food truck, we will go simpler on refreshments offered. A discussion was held on which topics to include in the panel discussions; suggestions included Diagnosing, stress, Lyme Disease, senior or mobility challenged exercises. 2018 Annual Meeting and Officer/Board Elections: Members were reminded that the Annual meeting will be held in January. Elections of board and officers will take place at the meeting. Housing Beautification Projects: A housing beautification proposal by Ellie was read by _____________. Discussion was held and it was determined that, as these properties are private properties and the owners’ responsibility, this was not a project PFF could do. Housing Task Force: John announced that Susan Icove is trying to create a Housing Task Force. There will be a general meeting in January 2018 and a possible up-coming fundraiser. Meeting was adjourned. There will be no meeting in December. Next meeting will be Monday, Jan. 15, 2018, at 6:30 pm at Wall Residences.